Despite their prominence among military and police, they have not been a huge player in the endurance athlete realm in recent years. I was intrigued to talk to them because I believe that many of the same standards for durability and quality that they meticulously incorporate into their products apply directly to the world of trail running and obstacle course racing. When I synced up with them, I soon discovered that they are indeed very interested our world and wanted to find out how their products held up. My hope is to provide you with an accurate assessment of the products that I tested as well as to provide feedback to Gargoyles to aide in their effort to make the perfect running and OCR sunglasses. DISCLAIMER: I am not affiliated with Gargoyles. However, they provided me with product for purposes of this review. The Assault ended up near the top of the models that I reviewed…overall, they were awesome! The Assault is a half-frame model. The lens are vented in the upper outside corner. The stems have a nice fit with rubber grip running along the back half. They also curve downward slightly toward the back preventing discomfort when wearing a hat. 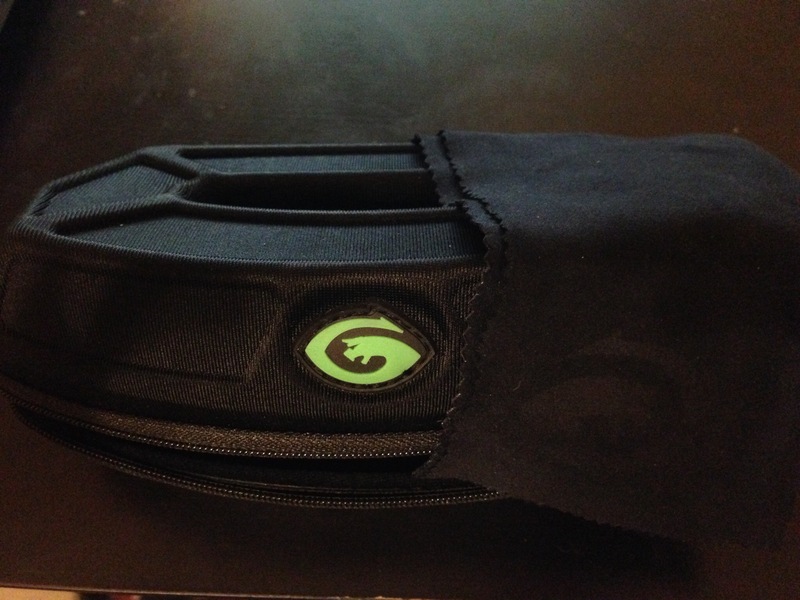 In all of the models that I reviewed from Gargoyles, I found the Breakaway to be the best option for running. The Breakaway is a half-frame model. Similarly to the Assault, the stems have a nice fit with rubber grip running along the back half. They also share the same nose pad. Overall, they have a very similar fit. The flux offered a slightly more fashionable (versus sporty) look to them, but don’t let that fool you, they are still high performing sunglasses. The Flux is a half rim model. They have less rubber on the stems, limited only to the back. The nose pad is also a deviation from the rest of the models I tested, and seems to be a bit grippier. When I look at the Pursuit, I immediately get the impression that they are targeted toward the world of cycling/triathlons…they just have that look to them. They have vented lens, good wraparound coverage, and are super light. I have mentioned in previous posts that I am not a fan of full frame sunglasses when running on trails as I tend to glance down by tilting my eyes instead of my head, which results in the bottom of the frame partially obstructing my view. At the same time, not everyone shares my opinion so I wanted to give them a shot. 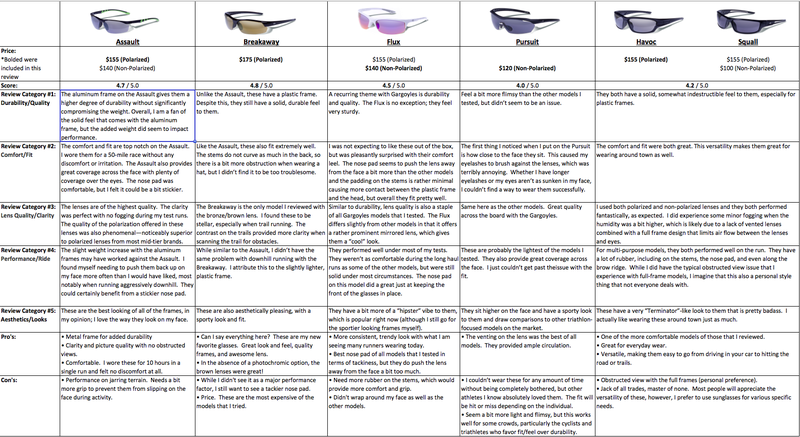 The following chart provides a side-by-side review of each model (click to enlarge). During my exhaustive testing, I was able to jump immediately to a single revelation: Gargoyles KNOWS how to make performance sunglasses! Sure, not every pair fit my face perfectly, but we all are shaped differently and that is to be expected. What I mean is that they are everything and more that you would expect from a high end product. With Gargoyles, it all starts with their lens. They are engineered to provide the highest level of durability and clarity. Beyond that, it is clear that they care about bringing well constructed products to the market and it shows from the time you first hold a pair. While their current product line was not engineered purely from a running perspective, they can compete with other high-end brands and their increased focus on this market segment should result in future models that excel even more. Polarized lens are high quality, they blow every other brand I have tested out of the water. This probably stems from the fact that they are owned by Foster-Grant, one of the top lens makers out there. In fact, the lens quality, clarity, and durability in general is second to none in my opinion. Very light yet durable frames that are made from high end materials and constructed to last. Hinged stems on the frames are a nice feature on all of the Gargoyles I tested. They keep the stem from opening up accidentally, preventing them from getting caught on things. This is a small detail that helps decrease the chance of breakage. Brand history and reputation. Gargoyles and their parent company Foster Grant are leaders and innovators in the space. They are a brand that has built loyalty, and they have done that with great products. Better nose guard with more grip to prevent bouncing/movement. Vented lenses to prevent fogging and improve air circulation. Completely absent from the product line was photochromic lens option. This NEEDS to be there in my opinion, particularly for trail runners that are used to running through areas that alternate between covered to exposed. Price is going to cause people to shy away from these. For those that take their eyewear seriously though, it shouldn’t. You get what you pay for and there is a ton of value in Gargoyles despite the price range due to their quality and performance. Aside from losing them, you can expect to have them for a long time! Color options. I might be getting nit-picky here, but I have seen a trend toward more colorful, fashionable sunglasses. Outside of the Flux and Pursuit, many of the color options were limited to darker colors, black or brown. Color has nothing to do with performance of course, but it does have to do with appealing to a broader audience. This entry was posted in Gear Reviews, Product Spotlight and tagged Accessories, eyewear, Gargoyles, gear review, product review, running, sunglasses, trail running, ultra running, ultrarunning by Ultrarunner Joe. Bookmark the permalink.